One of the Thai snacks that is often sold as a pair with Kow Gree-ap Pahk Mau (thin, flat steamed sweetmeat of glutinous rice flour) is Sah-koo Sai Moo (steamed tapioca filled with sweet pork). Sah-koo Sai Moo has a slightly sweet flavor mixed with a little salty. 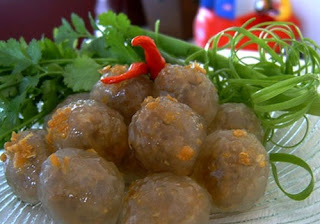 It is popular to have it with coriander, cabbage, and fresh Thai chili (Phrik Khee Nuu) to cleanse the oily taste. In addition it is the kind of food that is easy to eat, it is also simple to make, it does not require as much time and expertise to make as many other types of snacks. Fresh vegetables for side dish such as cabbage, coriander, fresh Thai chili (Phrik Khee Nuu), etc. 1. Rinse Tapioca granules with water thoroughly. Drain the water out with a strainer. Then add into a mixing bowl. Gradually add hot water into it, stir well, then cover with damp cheesecloth for about an hour. Later, thresh the tapioca until it becomes sticky and homogeneous. Then mold the tapioca into small ball shapes about ½ -1 inch in diameter. Set them aside. 2. Add the oil into the pan. Place the pan over medium heat until hot. Add 3 Tbsp chopped garlic to fry until yellow (careful not to burn), then scoop them out and set aside. 3. Pound coriander root, the remaining garlic, and pepper seed together util thoroughly fine. 4. Place the pan over medium heat. Add the remaining oil from frying the garlic 2 Tbsp into the pan. Wait until the oil is hot then add the pounded ingredients to fry until fragrant. Add chopped onions and minced pork to it. Stir fry the pork to be dispersed. Follow with chopped salted radish. Then season with palm sugar, fish sauce, soy sauce, seasoning sauce, and black soy sauce. Stir well. Taste to ensure it is salty and sweet. Add the peanuts. Stir fry together until becomes sticky. Turn off the heat. Lift it down and let it cool. 5. Start to wrap by spreading out the tapioca ball into a thin sheet. Put the filling in the middle. Then wrap it up completely with tapioca sheet. Then lay them down on the tray. 6. Place the cheesecloth down in the steamer. Lay the tapioca filling on the cheesecloth with a space approximately 1 cm on each side of each ball (provide for the steamed tapioca will expand). Then lift the steamer to boil in the boiling water and high heat about 10-15 minutes or until done then lift it down. 7. Place steamed tapioca filled with sweet pork (Sah-koo Sai Moo) onto the plate. Sprinkle with fried garlic. Serve with cabbage, coriander, and fresh Thai chili. Whether Sah-koo Sai Moo will be delicious or not depends on “the filling” having a mellow flavor, salty to lead and sweet to follow. And the tapioca must have the right consistency and stick together well, not too gummy so that it sticks on teeth or gums when chewing. 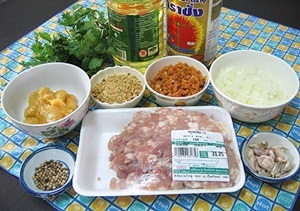 In addition to pork, the filling can be changed to something else instead, such as chicken, shrimp, fish or vegetables, etc. While stir frying the filling please be calm and cool, gradually continue to stir until the filling grips and sticks together well. The salted radish that you use, if it is very salty then it needs to be washed with water before chopping to reduce the saltiness. The peanuts that you use, they need to be roasted to be fragrant before pounding. And you must not pound too fine or too coarse. If pounded too fine, when you eat will not feel like you are eating the peanuts that are mixed in. In addition, the proportion of Sah-koo (tapioca) and the filling should about equal. Not like more tapioca and less filling. Or less tapioca and more filling and make the tapioca pierced. You should dip your hands into the water every time you spread the tapioca and mold it into the ball to prevent the stickiness of tapioca on your hands. If you prepare by molding the filling beforehand, that will help you to mold Sah-koo Sai Moo faster. Avoid molding it too big. Because when you steam them the cooked Sah-koo Sai Moo will expand more. Good Sah-koo Sai Moo when it is cooked, the tapioca must clear. If there is any white spots in the starch it shows that the Sah-koo is still raw yet. To steam Sah-koo Sai Moo is need to steam with boiling water in high heat. It takes approximately 10-15 minutes to be done (depends on the size of the tapioca (Sah-koo) too).